A few stray thoughts, some point of views………and a pessimistic observation. The victory of Modi is a foregone conclusion. The issue of debate is only the margin of victory, its implications for the nation in general and Gujarat in particular. I present here the future in simple terms without loading my arguments with statistical data. December 20 is also going to change the internal equations of BJP and the Saffron House for ever. A big electoral victory would catapult Modi into the central stage of Bharat. Modi would become the supreme leader. BJP and its leaders would be compelled to act as subservient to Modi’s dictates. The present cadre of leadership would have no control over the developing situations. Undoubtedly, his towering personality has made him the pivot of every activity in Gujarat. He is able to attract the powerful rich investors, considerable middle class, media and film stars to bolster his aspirations and establish him as an undisputed leader. He is unstoppable. Consequently, RSS would no longer be in the driving seat. He would play politics on his own terms which is something unusual and contrary to RSS history and discipline. His march towards Delhi would begin on Dec 20, 2012. Now, here is the rest of the story. Mulayam, Mamta and Maya would find it difficult to opt for Modi as they also need the Muslim votes for their survival. With Modi at the helm of affairs, BJP would find it difficult to forge new alliances. With the departure of Mr. Yedurappa from Karnataka BJP, Saffron Brigade has lost a powerful leader who had opened accounts of BJP in South India. Karnataka is about to slip from its stronghold. The results of Hills do not augur well for BJP. Defeat in Hills is almost certain as its victory in Gujarat. Mr. Gadkari, the present president of BJP has effectively become a liability for the party. The longer he sits at the top the more BJP is going to lose face. The convincing victory of Modi would leave BJP with no choice but to present him as the BJP’s Prime Ministrial candidate. And lo ! here comes the Guardian’s knot. Nitish Kumar will never accept Modi. He finds himself a suitable candidate for the prime minister chair. Mr. Nitish is obviously more acceptable to coalition partners even now. Mulayam, Mamta and Maya would find it difficult to opt for Modi as they also need the Muslim votes for their survival. With Modi at the helm of affairs, BJP would find it difficult to forge new alliances. The cultivation of new relationships would be an uphill task as the choice is limited. The time is running out. 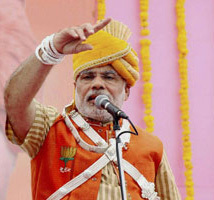 Ultimately, the victory of Narendra Modi in Gujarat would be a Waterloo for BJP ambitions in Delhi. No one should be blamed to conclude that RSS is learning to profit from the doctrines of Hitler. Its totally another matter that in its blind enmity against Muslims its favorite country in the world is Israel. IT WAS vintage Rahul Gandhi, an embodiment of courage and honesty, a modest youth leader who has finally thrown the gauntlet in the court of obscurantist, communalists and fascists. In his press conference in Bhopal on Wednesday he equated Rashtriya Swyamsevak Sangh with the banned Students Islamic Movement of India. The Sangh Parivar reacted by saying – Only a sick mind can do it. He seems to have lost his mental balance. The RSS is an institute of nationalist thought while SIMI is banned by Congress government as it was banned by us when we were in power. The writer is neither an particular admirer of Congress, Sonia Ji, Manmohan Singh or Rahul Baba. However, one must not fail to register the appreciation where and when it is due; one should not hesitate also to put the mirror if someone challenges the fundamental principle of co-existence and democracy. Following are the pearls of wisdom from the top luminary of RSS and it is left for the reader to draw his own conclusions. No one should be blamed to conclude that RSS is learning to profit from the doctrines of Hitler. Its totally another matter that in its blind enmity against Muslims its favorite country in the world is Israel. All fascist movements have few things in common. They begin as quasi-religious “spirited’ movements; they indoctrinate their follower to believe that they are in minority even if they are in majority and they put a lot of emphasis on health and purity of body. RSS is no exception. What they forget that the enlightened youth of India is not going to buy their anachronistic philosophy. The ordinary Indian youth recoil at the thought that they could be bound together by the chains of dogma and prejudice. 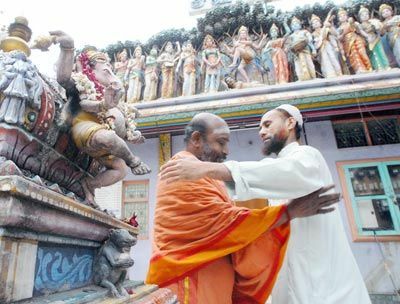 Needless to say that no Muslim has any problem with Hindutva as long as it doesn’t trample upon their fundamental rights; as long they are allowed to live with dignity; as long there is no apartheid. They know that followers of other faith won’t accept the saffronization of their lives at any cost. RSS has a flawed vision that inspires to debunk the secularism and adopt the undercurrents of TMI (Toxic Majoritarian Ideology). This is where Rahul Baba has hit them, this is where he has nailed them to the counter. The time is not very far when the Indians would realize that this organization is trying to wring the last drop of juice from Hindu ideology. We have full trust in the emerging enlightened youth. Well done Rahul ! Nitin Gadkari did it again ! We never expected any intelligent comment from Mr. Gadkari knowing his old Trade Union Congressman-turned RSS background. However, let me congratulate the BJP president for using a fine language of sarcasm this time. Calling CBI the Congress Bureau of Intimidation and declaring UPA has been using it against political adversaries as a weapon of vendetta, for friends as a protective umbrella and for those in between as a threat to make them fall in line. It%u2019s a real graduation FOR the same Gadkari who had earlier accused Mulayam Singh and Lalu Prasad of betraying the opposition on the cut motions in parliament and said: Bade daharte the sher jaise, aur kutte ke jaise ban kar Sonia-ji aur Congress ke ghar par talve chatne lage’ (these leaders were roaring like lions but later bowed like dogs to lick the feet of Sonia and the Congress). In Dehradun, the ebullient BJP president had also let lose his tongue, when he taunted the Congress over the delay in hanging of Afzal Guru. Improvement ! What is left for this villain of peace to say any more in Parliament? He was the cat’s paw of RSS in the heinous deed and he is proud of that. ‘Mandir waheen banega…” the slogan has lost its luster. RSS, its cohorts and fellow travelers fail to understand that history can never be corrected. All those who have demolished the places of worship irrespective of religion, caste and creed are no more alive. Why can’t we just forget the ugly past and make a new begining? Be rational and ask the government to show courage and let the supreme court give its full and final judgment. This would and should heal either way. You have n the places where Ram was supposed to have born. Just because a place of mosque is incidentally to be one on them so put every emphasis on liberation of that place to keep the wounds festering. It is no logic. Don’t use Astha as instrument of black mail for ever. Nations, religions, states and individual rise and fall with time. There is plenty to learn from past. Shastra Puja must have had its relevance in the distant past. However, in the present volatile atmosphere of our country this practice seems more to frighten the minorities rather than appease the Gods or deities of arms. I HAVE the highest regards for all the religions and I fully appreciate their traditions. However, reading two news items recently, I am at a loss to comprehend the logic, relevance and continuance of many practices followed by them. In one case, Gujarat Chief Minister Narendra Modi performed a ‘Shastra Puja’ (weapon worship) on the occasion of Dussehra at his house in Gandhinagar. 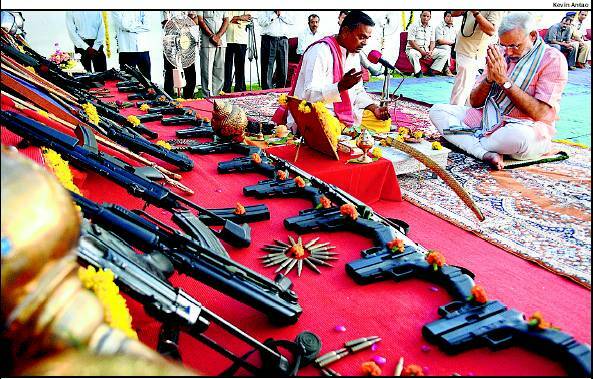 Weapons worshipped in this Puja were those used by Modi’s security jawans. Modi also gave a pep talk to personnel of various security forces present at the ceremony. In the other, Naresh Motwani, a 50-year-old flour mill owner, was participating in a ‘‘Shastra puja (worship of arms)’’ as part of the RSS’s foundation day programme. According to the police, a bullet from a pistol went off accidentally and shot through his throat killing him instantly. The incident occurred in RSS-run Saraswati Sishu Mandir school under Kamla nagar police station. Shastra Puja must have had its relevance in the distant past. However, in the present volatile atmosphere of our country this practice seems more to frighten the minorities rather than appease the Gods or deities of arms. Our cool and dispassionate Hindu brothers themselves can see the game behind it. If RSS exudes with so much love for weapons, it should demand the government to make at two to three years compulsary military training of all youth of both the sexes with an attractive stipend. Rather than these provocative demonstrations of belligerence, they should devote their energies to teach the masses about keeping our rivers clean. They should inculcate the virtues of honesty and integrity in every walk of life in our society. Let our smart Indian Army handle these games of arms. Let all the citizens of the country live in peace and friendship. Will someone tell these religious vigilante that their venomous Prachar and sowing of the seeds of religious hatred is no more acceptable to emerging India? These putrid policies have lost much of its sting. Secularism in the Indian context connotes the eradication of all attitudes and practices derived from religion which impedes the development and retard the growth of India as an integrated nation. Can’t we learn something from the cataclysmic dismemberment of Pakistan? It was a country founded on negative philosophies and ideologies. It was sewn and held together for a brief period on a questionable religious homogeneity. This homogeneity is nothing but the same as Cultural nationalism of RSS.